Russia was rocked today by some of its strongest protests yet as thousands rallied across the vast country to attack the Kremlin’s response to the global economic crisis. The marches, complete with Soviet-style red flags and banners, pose a challenge to a government which has faced little threat from the fragmented opposition and politically apathetic population during the boom years fuelled by oil. Pro-government thugs beat up some of the protesters. About 2,500 people marched across the far eastern port of Vladivostok to denounce the Cabinet’s decision to increase car import tariffs, shouting slogans urging Prime Minister Vladimir Putin to resign. Many there make their living by importing cars. Meanwhile in Moscow arrests were made as about 1,000 diehard Communists rallied in a central square hemmed in by heavy police cordons. Communist Party chief Gennady Zyuganov told them the Kremlin must throw out Western capitalism and impose sweeping nationalisation. Eduard Limonov, leader of the banned National Bolshevik Party – and one of the Kremlin’s most radical critics – was arrested at another Moscow square. 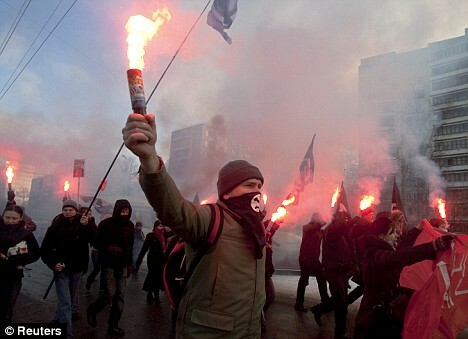 Police dispersed demonstrators from the United Civil Front, comprising several radical opposition groups, who launched an illegal rally on a street near the Kremlin. Protesters gathered near an Metro station but then sidestepped police by taking a train across the city to another location. Some of the protesters were later arrested. 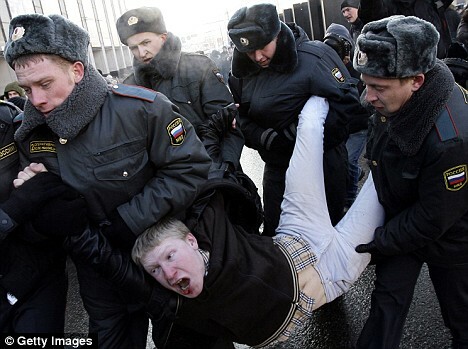 Others were brutally beaten up by activists from pro-Kremlin youth groups. ‘We are demanding civil freedoms and pushing for the government’s resignation,’ said one of the protesters, Valery Nadezhdin. Several van-loads of riot police only arrived at the site after protesters dispersed. The protests come after years in which the Kremlin has sidelined political opponents and established tight controls over civil society and the media, rolling back many post-Soviet freedoms. Today a small group of activists from an opposition youth group, We, stood near the Russian government’s monolithic headquarters with blank posters and their lips sealed with tape. All were arrested. The authorities countered with a rally of the main pro-Kremlin United Russia party next to the Kremlin – an area off-limits to all other demonstrations – where soldiers served hot tea and biscuits to some 9,000 participants. 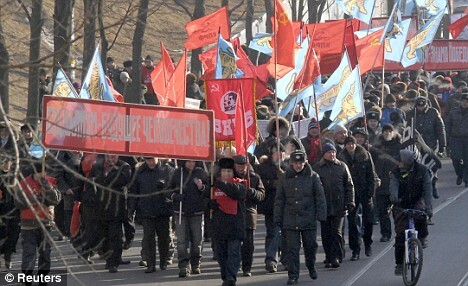 United Russia also staged similar rallies in several other cities across Russia. In St. Petersburg, where opposition groups were banned from holding rallies, they put individual protesters on the streets. Police took down his details. You are currently browsing the archives for the protesters category.